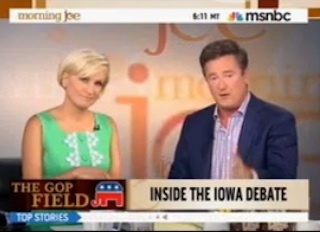 The morning after a big political event is always a good day for morning news programs such as MSNBC’s Morning Joe. Events like last night’s debate of GOP presidential candidates, hosted by Fox News, provide endless fodder that, while often predictable, is still informative entertainment for those who missed the action. What sets Morning Joe apart from its competition is the unpredictable, and sometimes brutally candid, assessments that often surprise. Take for example the following rant by host Joe Scarborough, who was without relent in completely dismissing the candidacy of Michele Bachmann, and the political import of Iowa as well. Michele Bachmann’s first answer, Mark Halperin, was, I wish the federal government had defaulted…had defaulted a week after Americans lost, some of them, perhaps, lost half of their pensions. Lost half of their 401(k)s with trillions of dollars that went down the drain with Americans suffering, she said that and got applause. And if anybody thinks that guys like my dad are going to be voting that way when this rolls out of Iowa and New Hampshire and South Carolina in the early stages and really gets going, they are out of their mind, and they are too stupid not only to prognosticate, too stupid to run Slurpee machines in Des Moines. I got it all off my chest. Michele Bachmann, she is a joke. And now I will pass it on to you. Her answer is a joke. Her candidacy is a joke, and anybody that sits here and says, she has any chance of winning anything is out of their mind. Take your straw poll, take your caucus, but Iowa, if you let her win, you prove your irrelevance once again. This comment will predictably be held up by Bachmann’s detractors, just as Scarborough detractors will just as predictably label him a ‘Rino” (Republican In Name Only.) But what’s great about the clip is that it is a refreshing departure from the typical pablum that passes for morning news show commentary.